NZCSC chairman Barry Brill has suggested to Environment Waikato that its Regional Policy Statement (RPS) should not be influenced by the climate change ‘Guidance Manuals’ (here and here) issued by the Ministry for the Environment in early 2008. Like the IPCC’s Fourth Assessment Report (4AR), their recommendations have been overtaken by recent scientific papers and data. His submission notes that modelled projections of 21st century warming rely upon two components – emission volumes and climate sensitivity. Here is his comment regarding Climate Sensitivity. The 17 models used for the 4AR produced a 2100 temperature range of 1.8°C – 4.4°C. Note at page 122 of the Manual, “this arises from taking the best estimate temperature change, and subtracting 40% to get the low end, and adding 60% to get the high end of the range”. The “most likely” temperature trend is 2.7C per century. The key driver of models is net climate sensitivity. It is well accepted that doubling pre-industrial CO2 levels (to 560ppm) will cause a direct temperature increase of approximately 1°C. This initial warming then causes a plethora of positive and negative feedbacks which eventually produce a ‘net’ effect somewhere in the range of 0.4°C to 4.0°C. Clouds (and atmospheric water vapour) are the major confounding element, having both positive and negative impacts depending upon height, type, shape, etc. None of the models have been verified or validated in any way. The IPCC requires, however, that all models are reasonably accurate in “hind-casting” actual 20th century temperatures. Modelling is as much an art as it is a science, and the IPCC does not contend that any one of the 17 models is correct. There is no statistical rule that accuracy can be achieved by averaging any number of inaccurate values. However, as the outputs represent the opinions of highly experienced teams of climate researchers, the IPCC regards the mean of those outputs as persuasive. While accepting that view, this submission notes the very high levels of uncertainty. In particular, 4AR considers that the feedback effects of clouds and water vapour are highly uncertain. The IPCC Models consistently display a “hotspot” in the upper tropical troposphere as a “fingerprint” of greenhouse gas forcing. Despite persistent efforts with weather balloons and satellites (especially during the past five years) scientists have not been able to verify the existence of the characteristic hotspot. (i)	Solomon et al (2010) found that the warming observed in the 1980 – 2000 period was partly attributable to an unexplained 10% increase in water vapour in the lower stratosphere. The paper estimated that 30% of the warming recorded during 1990 – 2000 was the result of this phenomenon. Stratospheric water vapour levels returned to normal in 2001 and subsequently, causing 21st century temperatures (to date) to be 25% lower than originally projected. (ii)	Schmittmer et al (2011) applied extensive historic reconstructions to establish that the range of net climate sensitivity is 1.7°C to 2.6°C, with 2.3° being most likely. The research team found “implausible” the “fat tail” of high levels reported in the 4AR, finding only “vanishing probabilities” for a value greater than 3.2°C. This conclusion supported an earlier paper by Annan & Hargreaves (2009) which proposed an upper range limit of 4.0°C. (iii)	Lindzen & Choi (2011) observed that outgoing radiation measurements (satellites 1985-2008) disclosed net negative feedback – implying that “the models are exaggerating climate sensitivity.” The net climate sensitivity was found to be 0.7°C (range 0.5°C – 1.3°C) at a 99% confidence level. (iv)	Spencer & Braswell (2011) found that the sensitivity and cloud cover assumed by models departed substantially from the earth’s measured heat-loss during 2000-10. 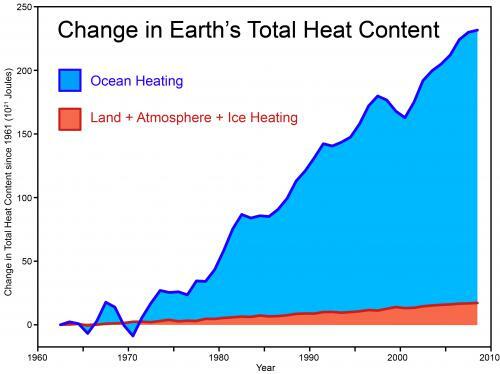 (v)	Douglass & Knox (2012) graph the recorded changes in ocean heat noting the heat loss of -0.03 W/m2 during 2001-9. The paper records climate shifts in 2002 and 2009, criticising the calculation of a trend across a climate shift. (vi)	Davies & Malloy (2012) of the University of Auckland reported that the average height of clouds declined by 44m/decade during the period 2000 – 2010. This decline denotes a major reduction in the global temperature trend at the rate of approximately 1.0°C/century, and indicates that net cloud feedbacks must have been negative so far this century. The updated science puts the theoretical net climate sensitivity at 2.3°C based on paleoclimatic studies (Schmittner), or 2.0°C based on physics (Solomon). The actual observed science suggests a total level (i.e. Human Warming + Natural Variability) of 0.7°C late last century (Lindzen) and about 0.0°C to date this century (Davies). The cumulative effect of these papers suggests that the IPCC projection of Human Warming at 2.7C/century should be adjusted down to approximately 1.0°C/century. This is about the same level as would arise from an unadjusted projection of the 20th century trend. Also worth considering is the work by Nic Lewis that showed that the IPCC have, in many cases, flattened out the probability distributions of sensitivities to give a bigger “long tail” than was in the original work. has quite a long and sometimes technical discussion on the Bayesian statistics used, and the authors of the Forster/Gregory paper pop up in the comments to say that they disagree with Nic Lewis’s conclusions. In other words, the effects will be somewhere between benign and catastrophic. But which end is right? The IPCC solve this profound puzzle by taking a simple average. This is the classic case – if you have one foot encased in ice and the other in a fire, you will be comfortable ‘on average’. Its very easy to manage. You get a high figure by including a high outlier, and vice versa. No matter that all 17 models are known to be wrong. The average will give us the right answer with sufficient certainty for billion-dollar policy-making. I’ve been looking at the IPCC projections with the current data. I wondered this: if the models had been run from 1960, would the error bars be the same magnitude as they are going ahead from 2010? Would the year 2010 have the same, extended error bar as in 2060? The question relates to the models ability to predict ANYTHING. Do the models actually predict 1960 to 2010, or were the assumed variability of parameters simply dropped to that to match the observations? Models have a major flaw which is discussed in my peer-reviewed paper linked below. This being the luke-warmer view now coming under increasing attack from the Slayers. Thank you Doug C for focusing minds on the screwball notion that GHG DLR warms the ocean. Dr Roy Clark shredded that idea in his US Senate EPA Submission ‘A Null Hypothesis For CO2’ 2009. But even now CSIRO and BoM are continuing to peddle bogosity to the media reporting their latest ‘State of the Climate’ report. From sky NEWS ‘Climate changing despite cool years’. Dr Braganza points out that most of the warming of the earth’s atmosphere is transmitted into the oceans. An insulation effect at the cool-skin layer (as promulgated by Peter Minnet, Real Climate and Rob Painting, Skeptical Science) would be ineffective because energy would still be lost radiatively and evaporatively even if conduction was inhibited (it isn’t). If heat from the atmosphere is “transmitted” to the ocean the temperature gradient must be atm => ocean but global average atm temperature is about 3 C COOLER than the ocean and atm LAGS ocean. And that’s not accounting for the respective specific heat capacities – Braganza and Fraser don’t seem ready for that level of “basic physics” even when the atm => ocean gradient does exist. It astounds me that Braganza and Fraser can disseminate such rubbish and not be taken to task by physics experts who understand the nature of radiative heating, heat transfer and insulation. H&Q73 is commercially driven and copyrighted experimental science, there are corroborations but H&Q73 is cited 1682 times so I think its reputable. The copyright is held by OMLC (Oregon Medical Laser Centre). Where are the Australian equivalents from the medical radiography and oceanography fraternity? Even if Braganza and Fraser are right (they’re not), they then have to quantify how much of the atmospheric warming supposedly “transmitted” to the ocean is anthropogenic. ‘Most of the sea level increase is due to thermal expansion – the heating of the water – there is only a small contribution from melting ice,’ Dr Braganza said. He’s right for when sea level WAS increasing but now its not. Jason-1/2 GMSL shows sea level deceleration since 2004 and flat since beginning of 2010. HadSST shows surface sea temperatures falling since 2005. How would Australia’s Ministry of Truth deal with sky NEWS I wonder? Climate blogger Anthony Watts perplexes his readers with a spiteful outburst against fellow skeptics of man-made global warming. The host of the world’s most read science blog has made it clear he won’t tolerate any dissent against his beloved greenhouse gas theory, the scientific cornerstone of man-made global warming alarm. Watts has never baulked at privately bad mouthing the Slayers’ groundbreaking book,’Slaying the Sky Dragon: Death of the Greenhouse Gas Theory’ that he admits he hasn’t read. But in the last year Watts has increasingly gone public to let it be known that he refuses to countenance any debate on his website about the validity of the greenhouse gas theory, which he unquestioningly accepts.